Over the decades, players have been continually inspired by the sound of a Strat. From the clarity of the high end, through the gut punch of the mids and the solid lows, it's a sound that's helped define what an electric guitar should be—versatile enough for any style and broad enough for any player to find an individual voice. 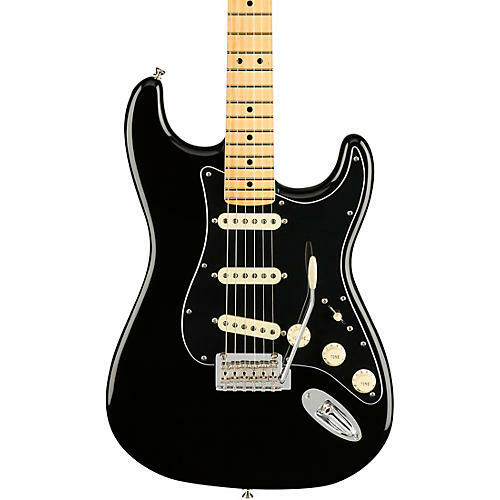 This Player Series Stratocaster comes in a special black finish with black pickguard and puts all of the classic features of the Strat at your fingertips while adding a modern edge, including a modern neck profile, medium-jumbo frets and a freshly redesigned 2-point fulcrum vibrato bridge. With a beautiful gloss finish over a solid alder body, a 22-fret maple fingerboard with a contemporary 9.5" radius for easy bending, the Player Series Stratocaster is primed and ready to carry you along your musical voyage. Case sold separately.